New Hampshire Heating Guide: Where Is My Boiler Leaking From? Boiler leaks are not always obvious. Often, they occur in places that are difficult to access or hidden by covers. Consulting your boiler technician is the first step to repairing a leaking system. For over 20 years, HB Energy Solutions has installed, repaired and serviced boilers. If you think your boiler might be leaking, call us today. Boiler problems can be tricky for homeowners to detect. After all, sometimes the only indication a boiler leaks is a drop in system pressure. But this may occur at such a slow rate that it’s nearly undetectable. When it’s particularly slow, there can be little trace, for small amounts of leaked water evaporate on the hot piping. At times of high usage during the winter months, leaks may be more noticeable because the total system pressure is at its peak rate throughout the year. Comprehensive system inspection. Unless the affected component or area is obvious, there is no substitute for the discriminating eyes of a professional. They’ll check your hot water piping, boiler, controls, valves, circulator pumps, piping elbows, baseboards, and radiators to look for evidence of mineral depositing, which may indicate a leak. Water supply shut-off. Temporarily shutting off the water from the boiler allows the boiler technician to monitor the resulting pressure. Thermography. If all else fails, there are certain technologically-advanced measures to take, like using thermography cameras, which can detect abnormally hot points in the system. This can help pinpoint the location of hard-to-find leaks. If your boiler is no longer working as it once did, or if you have noticed pressure loss over the past few weeks or months, your system may have a leak. HB Energy Solutions are only a call away. Contact us today for more information about boiler repair in New Hampshire. 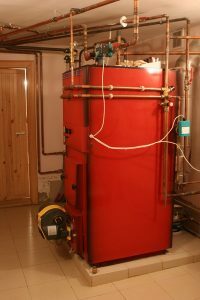 Posted in Heating | Comments Off on New Hampshire Heating Guide: Where Is My Boiler Leaking From?